DCC stands for Digital Command Control. What makes it different for DC control is that with DCC the locos are controlled directly via an internal control chip instead of being controlled by the increasing and decreasing of current in the track. The track is always kept at the same current but also carries the digital control signals to the chips in the locomotive which in turn control the operation of the locomotive. DCC chips can have more than 2 functions (forward and backwards). The chips can also control such things as the directional lights and a sound module. With DCC there is no need for isolating sections or for using points to isolate sections of track to isolate a locomotive for example in sidings. The controller controls the trains themselves meaning that two trains can run on the same track. This also means that you can run two trains head on in to each other. This ability to run more than one train on each track opens up some more interesting locomotive operations such as double heading and banking. You can even run a HST train with both locos being controlled by the same controller at the same time. It also allows you to pack sidings full of locos without having to have lots of isolating sections with the complex wiring that is involved. Each decoder is given a different identity so that each decoder can be controlled separately. You can if you want give them the same number if you want them both to be controlled at the same time. "The Hornby Select digital controller is the perfect way to enter the digital world of model railways. Each locomotive can be coded with up to 99 levels of acceleration or deceleration speed (inertia). The LCD display screen of the Select shows the number of the loco or accessory which has been selected. Power is through a standard wall mounted transformer which supplies 1 amp 15V DC power to the track; a larger 4 amp transformer is available which will provide additional power to the track for more locomotives to be run at the same time." "For those who wish to take their train control to a new and advanced level, the Hornby Elite is the ideal companion. Capable of answering the needs of most railway layouts, this advanced unit with twin control and wide function LCD screen can carry 255 registered locomotive addresses and the same number of accessories, plus a USB portal for linking to a personal computer. Once inputted and assigned, the unit will also display the names and running numbers of locomotives, as well as train direction, speed and function indicators. A clock is also included on the display which can be set to real time or up to 10x faster. The Elite is supplied with a 4 amp transformer which is capable of providing enough power to run approximately eight locomotives at any one time." "E-Z COMMAND allows the operator to digitally control speed, lighting and direction of multiple locomotives. 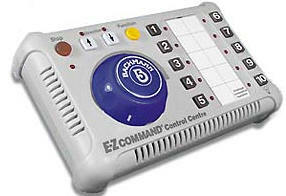 Unlike other complicated digital command control (DCC) systems, E-Z COMMAND provides simple and straight forward digital operation of your layout. (Click here) "E-Z Command Dynamis allows the operator total freedom by integrating advanced infra red wireless technology into an affordable and powerful Digital Command Control System. Using a unique toggle style joystick both speed and selection of locomotive are controlled. A backlit LCD screen with graphical interface and easy to use menu buttons make programming of CVs and operation of the unit is simplicity itself. Locomotives can be recalled by either selecting the locomotives by Name or Number and both 2 and 4 digit addressing is supported. The 10 function buttons allow for simple One Touch Operation allowing for different sounds and lighting to be operated. In addition by simply selecting A or B bank on the menu button you can operate decoders which support up to 20 functions."